Have you ever felt there was a conflict between dealers and customers, when it comes to car repair? Are you as distrustful of the people in your dealer’s service department as you were when you bought the care, and had to interact with a car salesman? Like many people, you probably like your car and want to keep it operating properly so you’ll get every possible mile out of it. But should you always have the work performed at the dealership? Have you ever seen a McDonald’s close and go out of business? How about an auto dealership? Probably not very often. It is simple business common sense – car dealerships can’t exist unless they are profitable. This is true for every business, from your local neighborhood grocer to a national retailer like Target. But unlike pizza parlors, car dealers have multiple streams of revenue… and profitability. And there are a lot of dealerships around, aren’t there? The hundreds of sparkling new cars might lead you to believe that car sales are where the dealers make most of the money. But that’s not the case. According to data from the National Automobile Dealers Association (NADA), the new vehicle department of a car dealership accounts for about 30 percent of a dealership’s gross profits. In addition to sales of new cars that percentage also reflects profits from the fee’s the dealers get from lending institutions (when they write a car loan with a specific lender they receive a fee) and insurance products sold on new cars. That also means Gap insurance, alarm systems and, notably, extended warranties make the dealers money as well. Then there is the used vehicle department, which can represent almost 26 percent of a dealership’s gross profit, according to NADA. Again, like the new cars, the figure also reflects profits from loans, products, etc. that are sold with the used cars. In 2013, the average U.S. dealership produced a return on equity of 29 percent, according to the National Automobile Dealers Association. That figure has risen in four of the past five years and is now more than double the 12 percent return recorded in 2008 when U.S. vehicle sales collapsed. So where does the majority of a dealership’s profit come from? It’s not from car sales: at least not directly. It’s from the service and parts department, which accounts for 44 percent of the dealership’s gross profits, according to NADA. (2014) The National Automobile Dealers Association, which represents the 16,300 auto dealers in the U.S., said that the average auto dealership boosted its net profit (before taxes) in 2014 by 6.7 percent, to $1.09 million. It’s the fifth straight year dealers have increased net profits, though the profit margin of 2.2 percent remained unchanged compared to the prior year. So as you can see the life’s blood for a car dealership is the service department. And there lies the conflict between dealers and customers. The larger and more successful the business, car dealerships in this context, the more pressure to grow revenue travels downhill. This most likely invokes thoughts of the car salesman and the tribulations of commission sales jobs. But there is equal pressure from the boss to the service manager, especially since we have discussed the profitability of service departments. What do those service managers do? 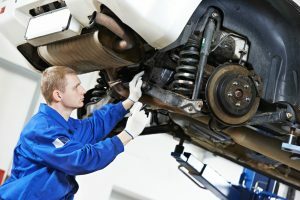 They push the technicians to “discover” issues with a car, things that were not the reason why the car was brought it but can add to the value of the job. According to one mechanic, who used to work at an area dealership: “We were instructed that if a car went up on a lift we had to find at least $250 worth of additional work to justify the overhead of using the bay and lift. I saw other mechanics literally damaging the customer’s vehicles to meet this expectation”. Being an independent car repair shop we get the see the aftermath of the dealership service departments. People come in for a second opinion and learn that their dealership proposed work, or in too many instances performed work, that wasn’t really necessary. It is not our intention to impugn the reputation of any specific brand or dealer, nor do we believe that every dealership is corrupt or dishonest. But far too often the dealer’s charges or suggested work proves to be excessive. Our recommendation? If it is convenient for you to get a second opinion, let Lebanon Friendly Sunoco take a look. Our business is only as good as our reputation and after 18 years, we have a pretty good track record of successfully exceeding our customer’s expectations.